^ （英文） Schiesel, Seth. The Game Is a Hit, But the Work Isn't Done. 纽约时报. 2005-02-10 [2008-09-12]. ^ 2.0 2.1 2.2 2.3 （英文） Vortex, Cecil. An Interview with Chris Metzen. 2008-04-21 [2008-07-21]. （原始内容存档于2008-07-06）. 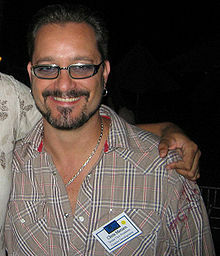 ^ （英文） Chris Metzen To Publish His Own Comic Book. Blizzplanet. 2008-04-18 [2008-07-21]. ^ （英文） Warcraft: Orcs and Humans credits. Allgame. [2008-07-28]. ^ （英文） Underwood, Peter. Warcraft II: Tides of Darkness Credits. Warcraft II Battle.net Edition (manual). 暴雪娱乐. 1999: 94. ^ （英文） Diablo credits. Allgame. [2008-07-28]. ^ （英文） StarCraft is an Amazing Story. IGN. 1999-03-23 [2008-08-26]. ^ （英文） Diablo II credits. Allgame. [2008-07-28]. ^ （英文） Credits. Warcraft III: Reign of Chaos (manual). 暴雪娱乐. 2003: 90. ^ Warcraft: Of Blood and Honor (eBook). Simon & Schuster. [2008-07-28]. ^ （英文） World of Warcraft credits. Allgame. [2008-07-28]. ^ （英文） Metzen, Chris. Battle Reports: Soldier: 76. Sons of the Storm. 2005-02-15 [2008-07-22]. ^ 14.0 14.1 14.2 14.3 （英文） Artist profile: Chris Metzen. Sons of the Storm. [2008-07-21]. ^ （英文） Interview with Chris Metzen. Games for Windows官方杂志. 1UP.com. 2007-06-12 [2008-07-21]. （原始内容存档于2012-12-06）.